Established in 1939, Overland Stock Yard has become the leading dairy livestock auction in the nation. 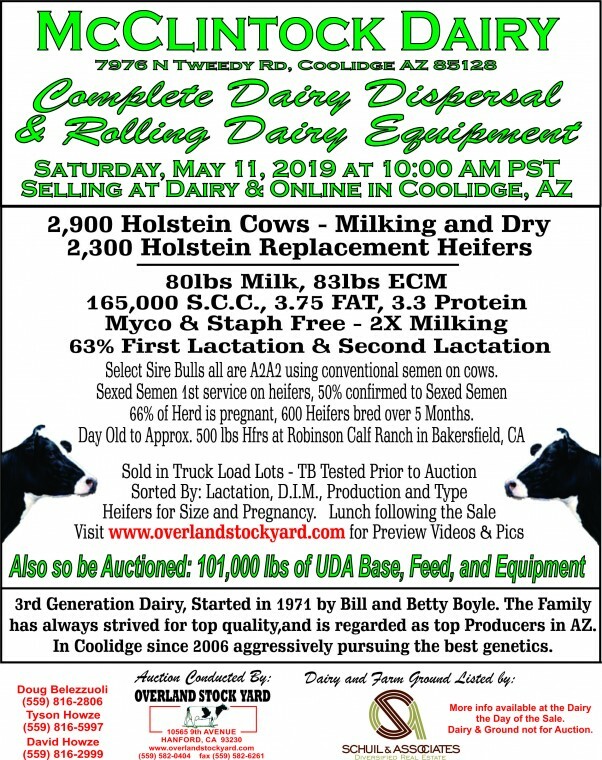 Conducting Dairy Dispersal and Dairy Replacement Heifer Auctions throughout the Western United States. Overland has a dedicated team of professionals to handle advertising, printed auction brochures, pre-auction preparation of livestock, marketing and post-Auction shipping. In March of 2010, Overland Stock Yard conducted its first Holstein Steer Video Auction featuring truck load lots of Age & Source Verified Holstein Calves. Video Auctions are now conducted the last Thursday of each month and offer in excess of 10,000 head. As a family owned business, Overland Stock Yard prides itself in offering the best in livestock auction services both locally and nationwide. Check out the Video Below to see Aerial Views of Overland Stock Yard!